On 9th March we will be hosting a skillshare evening in the Secret Garden at our office in Edinburgh as part of the “pass it on week” in association with Recycle for Scotland. This is Scotland’s annual week to encourage keeping things in use for as long as possible by passing on, swapping, sharing or donating things you no longer use. 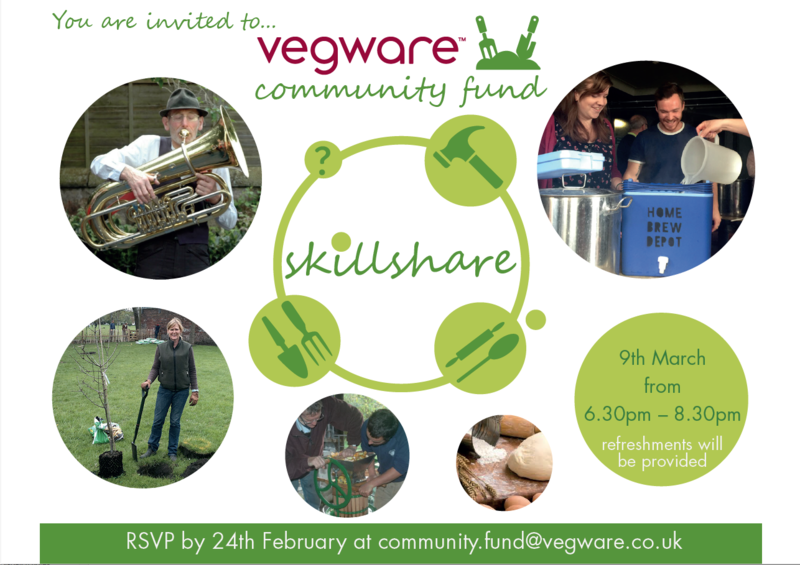 We thought this would be the perfect opportunity for many of our recipients and those connected to Vegware to get together, meet each other, and share any skills they may have. This could be anything from gardening tips to brewing your own beer so don’t hold back! Saying that, please do not feel under pressure to have to bring a skill to share as we would still love you to come along and enjoy the evening with a chance to network and learn more about us and the people we support! This will be an informal event with the chance to mingle and learn new things however, we would also be happy if anyone would like to give a short presentation about the work they do or a skill they have. Please let us know if this is you and we can add you into the schedule in this capacity. Refreshments will also be provided by Vegware! If you are interested in attending please email community.fund@vegware.co.uk.